On the way back from a vacation a small actors group called Anshoku Tent is suddenly stranded amidst a snowstorm, when the highway bus encounters engine troubles. Trying to find the way to the nearest station on their own they get lost in the white desert of the japanese mountains. It is when they come across a strange western style mansion that hope again rekindles among them. But is this mansion really a safe haven for author Rindou Ryouichi and the actors under the leadership of his best friend Yarinaka Akisaya? Or may the so-called Kirigoetei even harbour a malicious spirit that wants to devour them all? This was my first book by mystery-author Ayatsuji, but I suppose it won’t be the last one. I really enjoyed this novel even though it was so fundamentally different from what I had expected. 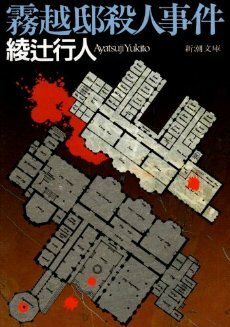 Only after reading it did I find out, that this was not written to be a classical detective story, like his Kan-Series is supposed to be, but more or less a de- and reconstruction of 推理 and ミステリー. But that does not mean that classical deductive work cannot be used here. More than anything it was the clever deduction of many characters that made it such a worthwhile read. They are always conscious of the fact that their story play out like classical detective fiction, which leads to some interesting commentaries on the matter in itself, but also to some quite intriguing meta-discussions. The fact that the story is told from a point in time far later than the main events of the novel makes it possible for the narrator to comment on certain situations and actually both taunt and aid the reader at certain points. And many will agree, that there are few things more irritating than a narrator telling us that an important clue is right in front of our eyes, but even he does not know if he could have been able to see it back then. But it irritated me in a good way, as it always kept my guard up. Another strong part was of course the setting. Somehow a mix between Agatha Christie’s famous perfect locked room scenarios And then there were none and Murder on the Orient Express it still expresses an otherworldly fascination that makes it go beyond a simple crime scene. While the mansion really was a creepy place, Ayatsuji put so much effort into making the building an actual character in the story, you just have to fall in love with it. It just tickles the sense of adventure with its many hallways, locked doors, hundreds of shelves, cupboards and it’s many small items that may or may not become important. Even though it is beyond imagination in its variety, it truly comes alive while reading about it. There is still the most important question when it comes to detective fiction, “is the case actually solvable and does it make sense? “. This is pretty difficult to answer and maybe the reason it took so long for me to actually write this. I would dare to say, it is solvable, but not for many people. It’s like in a good Whodunnit, where you have all the evidence in front of you, but you just lack the knowledge to piece them together. Some of the clues where actually so well disguised I think it would take a genius to actually notice them during the first read, but in the end it was exactly that which made the case so fascinating to me. Even though I noticed many of the clues and was even on a very good way to solving who did it, the real devices to pin the culprit down just kept slipping through my fingers. I always welcome it when a mystery actually makes me think. If it makes sense, well, that is a whole other matter. Though the characters fascinated me and I understand both their motivations and actions, it always felt pretty surreal. Even after leaving the Kirigoetei behind it is still shrouded in a sense of mystery and otherworldiness, as if it had sprung from the mist of dreamland only to vanish back into it. While the case is solved somehow order is not fully restored and, as if a small invisible crack in a window had suddenly grown larger, we now feel the constant presence of the uncanny more than before. To sum it up, it was no easy read. Ayatsuji is a knowledgable man and likes to slip in seemingly unrelated knowledge here and there, but at the same masters to refer back to it at another point. Yet many things are explained a bit too rudimentary for my taste and many times I had to stop reading and look up certain references (e.g. the golden apple of Eris). I wouldn’t say it bothered me, but this book is surely not one for impatient readers (which I tend to be). It was also the aforementioned feeling of unease, the uncanny that somehow stayed with me even after finishing the book, which made it a heavier read than casual detective fiction. While many authors manage to make me think of a book after I finished it, like recently Carr with The Hollow Man or Christie with Ordeal by Innocence, this one had a different effect on me that I still cannot fully shake off. Do I recommend Kirigoetei? definitely! While it is not a sure-fire hit and might escape some classical definitions it is a very enthralling read and you really start caring for both the characters and the case. So if you are ready to take some risk and actually devote a little bit more time, those 690 pages can be something that you can talk about way after you finished it. ~ by seizonsha on 2010/03/11.